Name this folder: BF2_DVD. This will be the name (Label) of our DVD. NOTE: Any name (Label) you choose for your DVD will work! 2) Download the Custom Installer, (created by ‘Thrillkill’) from here and extract to the Temp folder. Note: All folders, for each game, are included with the Custom Installer. You can view the Custom Installer here. Thrillkill has done another fine job with an update to his installer. You can download his updated BF2 v1.4 Installer from here. You can view his Custom Installer here. NOTE: The installer actually has a transparent background even though it appears white when viewed on the Installer page! 3) Copy all the contents from the BF2 CD1 to the ‘BF2’ folder. 4) From the BF2 CD2 copy only the ‘data3.cab’ file to the same ‘BF2’ folder. 5) From the BF2 CD3 copy only the ‘data4.cab’ file to the same ‘BF2’ folder. 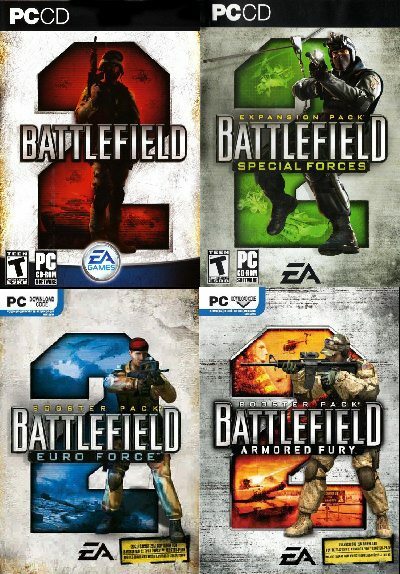 8) Copy all the files for Euro Force to the ‘BF2EF’ folder. 9) Copy all the files for Armored Fury to the ‘BF2AF’ folder. 10) Copy any needed Update Patches to the ‘updates’ folder. Note: Clicking the ‘Updates’ button on the installer will only open the Updates Folder. From there double click the updates to install. 11) Copy any Custom Maps or Custom Mods to the ‘mapsmodsmedia’ folder. 12) Copy your favorite Battlefield 2 Internet address’s (web links) to the ‘links’ folder. 13) Paste all your Serial’s (CD Keys) into the ‘yourkeys.txt’ which can be found in the ‘keys’ folder. 14) Burn the contents of the Temp folder to a DVD using any Label you choose.